Ukiyaseed has given some rather reliable information and sources. While I normally don't like giving updates and would rather give my opinion about them -- I did start making some whacked up predictions and thoughts on Don Armage's true identity (and even speculated he would actually be Mel Brooks) based on magazine scans. Now, I'd like to just let out some crazy ideas that I have or whacked up predictions. I can't deny that I do change my opinions every now and then -- it's just like I tend to prefer older vs. newer shows based on how good things go for me, I tend to think newer Kamen Rider is better than newer Super Sentai then I'm recently taking a short break from Kamen Rider Zi-O (to at least recharge my Rider vibes) then the same can be said about two shows. One is Kosoku Sentai Turboranger and Gekisou Sentai Carranger -- which one really shifted into Turbo is somewhat based on personal preference. I almost didn't want to watch Ryusoulger due to the fact I had my ongoing preconceived biases such as, "Oh boy! Not another dinosaur Sentai! Toei think of something else! 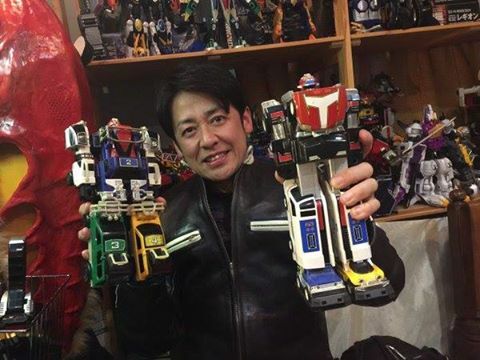 ", "Sentai's gone too long and I'm better off with other stuff." or stuff like that. You know the whole issue of a generation gap can be jarring -- it's possible to embrace the need for modernization while not accepting everything modern. 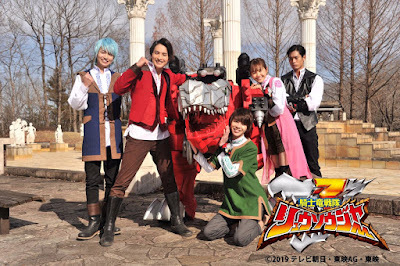 Then I thought watching Ryusoulger doesn't only bring back memories of Dragon Quest -- it also reminds me of Saban Entertainment's attempt to enter the sword and sorcery genre with Mystic Knights of Tir Na Nog. It was most likely an attempt to ride on the hype of Hercules and Xena. It had me wondering why Toei and Saban didn't bother to work together to make a live adaptation of Dragon Quest based on Erdrick's adventures against the Dragon Lord or Abel's adventures against Zoma? Well it's another week of Ryusoulger! I can't deny that J-Drama writer Junpei Yamaoka is showing more signs of what I'd call adding my favorite dramatic elements into Super Sentai. Back then, we had that with Jetman. 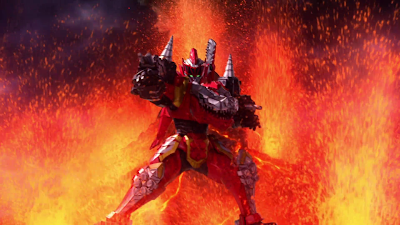 Now, we're getting it with Ryusoulger although I'm just setting a low bar. After all, it's his first time to try and do Tokusatsu -- something vastly different than J-Drama, right? Also, what's interesting is that this time -- we're getting the first Super Sentai episode in so many years where the opening theme plays first before the show begins. 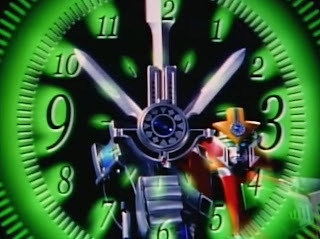 Midway, Hurricanger started to play the introduction to the episode before the theme song -- a trend that went on up to last week's episode. I wonder will playing the song first before the introduction be done all throughout? Do you remember how much of a hit Goranger was? It's a Tough Act of Follow -- innovate something THAT GOOD and expect yourself to release work that won't be as well-received. JAKQ was at Goranger's shadow and lasted for only 35 episodes. However, its additional member Banba Soukichi ended up as a big time mascot for Super Sentai -- though Hiroshi Miyauchi flatly declined the idea to become the face of Tokusatsu! Is it me or did Toei get addicted to the Jurassic World: Fallen Kingdom film last 2018? 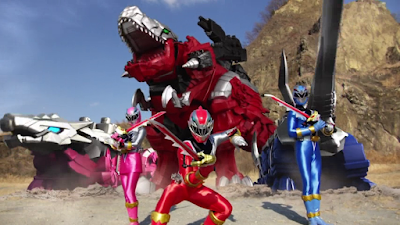 We're having dinosaurs again and I was getting worried I would have bad first impressions like Kyoryuger -- a series that I tend not to like as much as Abaranger and Zyuranger. But I managed to get impressed by how it does have some vibes to the Dragon Quest game series (and maybe Knights of Tir Na Nog which was Saban's original production) more than it would have with dinosaurs. Plus, mecha design is pretty good too! Now just be ready for me to turn into a fake Medieval times Englishman while writing the weekly reviews! 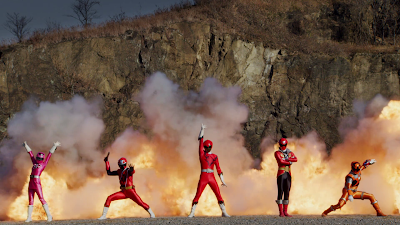 Super Sentai may not be perfect, it has its flaws, it had its reduction in ratings from time to time then it has recovery periods, there are times when there's a single Super Sentai series that wouldn't immediately kick off and would require its staunchest fans to defend it. However, Power Rangers has been stuck in the Krusty Krab since 2011 after it got out of Hanna Montana land around 2010. It's best to even say that Power Rangers jumped off from the frying pan and into the fire! Now, I'd like to compare the four-part mini-series to that rather rushed Dimensions in Danger! Let's start with the main characters, shall we? The Super Sentai Morphing Grid?